How’s that for a title? Folks, I like to break out the ol’ Crock Pot once in a while, do a few minutes of work, toss it all together and come back hours later when the food is done. Beef stew is one of those things. Since it’s also winter and root vegetables are cheap readily available, and well – I like root veggies, and the fact that they go well in stew… that’s what I did. Some of this… some of that… OH! That, too! Stew is easy. I don’t use a recipe, I just use what ever I have around the kitchen, brown the meat, prep the veggies and toss it all into the Crock Pot. 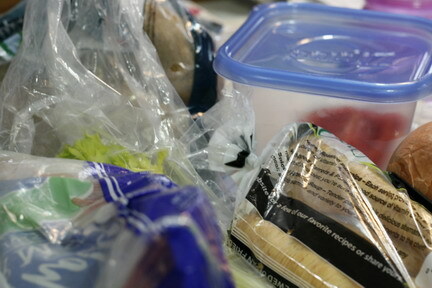 I will also admit that even though this is terribly, terribly non-tree-huggery of me – I LOVE those crock pot liners!! Very little cleanup is involved with them. Another wonderful aspect of stew – stew meat is inexpensive because it tends to be tough if you don’t let it cook for a long time, which is why it’s called “stew meat” – and it’s perfect for long, slow cooking. You can also make stew into one of those “stretch” meals – this one made about 10 generous servings. So, call this what you will, for me “Kitchen Sink Beef Stew” is probably the best name for what I make. 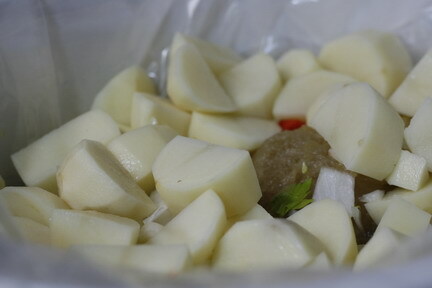 I had about two pounds of russet potatoes, half a red bell pepper, a one pound bag of parsnips*, turnips, five large carrots, a couple ribs of celery and onions (I only used one). I was out of garlic, but I had garlic powder, garlic salt and salt. Since the best thing to do for crock pottery cooking is to brown the meat before tossing it into said crock pot, and you should really season the meat first… I took some flour (gluten free of course), about a quarter cup, two teaspoons of the garlic salt and a teaspoon of pepper, mixed those together and then tossed that with the stew meat. I know that seems like a lot of salt, but I was adding TWO POUNDS of potatoes to the stew, so I actually added more salt later on. 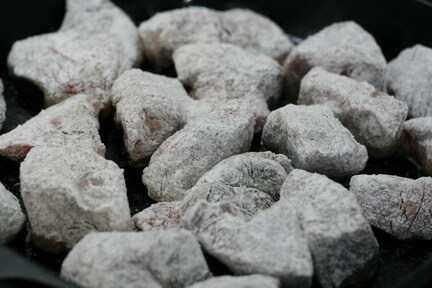 Once the the meat was coated, I browned it in a hot, cast iron skillet in a couple tablespoons of olive oil. Another thing with crock pottery cooking (oh… that is sticking…) is that you should add your veggies to the pot first, then the meat, then the liquid. I cleaned, peeled and chopped all of the veggies into big, ol’ chunks and put them in the pot. This isn’t rocket science (I should know… DH’s brother actually IS a rocket scientist)… crock pottery cooking should not stress you, or anyone, out over whether or not you “did it right”. You have to try to screw this up – seriously. Veggies tossed in, I poured in some other “kitchen sink” ingredients… some leftover, homemade goat stock, a glass of red wine leftover in the bottle and a pint of my Mom’s awesome homemade, stewed tomatoes. Now, I don’t like to go overboard with the salt. I like salt, my cardiologist has actually said to me, “Please, for the love of God…. INDULGE in some salt!” But, I don’t want to toss too much in the mix too soon because you can always add MORE salt later. You can’t really remove it very well if you put in too much. At this point, the liquid I have added with the stock, wine and stewed tomatoes is enough, but do you remember the flour/salt/pepper combo? I saved what didn’t adhere to the meat so I could shake that up with some water to thicken this stew later on. I know – the books all say to throw it out. Listen, you do what you need to do, but for me – I was adding in my flour/water mixture a couple hours before the stew was ready, and with things cooking on high – everything was going to be a-okay. 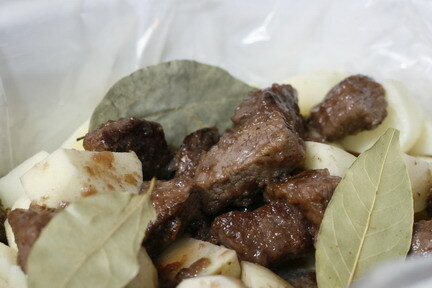 Your stew meat should have been plenty browned by now, toss it on top (I “broke” the rule about adding the liquid last and I don’t care), add any herbs or seasonings you want to add (bay leaves for me), cover and cook on high for at least 6 hours, mine went about eight. Now, since I cooked my stew about 8 hours, at the 6 hour mark, I took the leftover flour mixture, added that to a jar with water, shook it all up and poured it into the crock pot, giving a stir. This thickens up the liquid – making the stew. Veggie scraps make chickens happy. 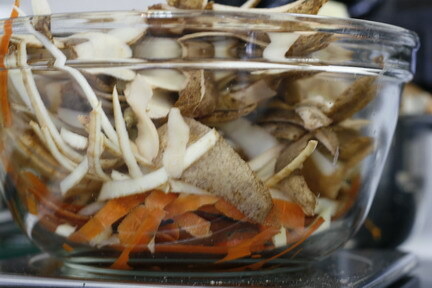 Now while we’re waiting for that to cook, all of these veggies created a whole lot of peelings. I’m frugal (as evidenced by the flour combo thing…), and I also have chickens. I know what my chickens like and don’t like (usually), and while they aren’t crazy about potato peelings during the summer months, they DO eat them during the winter months because they’re “fresh” food. I have a “compost bowl” on my stove top that the coffee grounds, tea bags and peanut shells all go into, but vegetable scraps and fruit scraps that the chickens will eat (they won’t eat orange rind… at least not much of it) go into another bowl to get taken to them in the evening. I like to keep my flock happy. And now we’re back to cooking. The other nice thing about crock pottery cooking is that you can do a lot of the work in the morning, and if you enjoy having a lazy weekend day, it’s the perfect tool to allow you to have your lazy day of reading and drinking cooking with wine. Some wine for the dish… some wine for you. Some more wine for you later when you’re eating the dish. I happened to enjoy the Sabrevois from Weggy Winery with this stew and served it with some GF “English Muffins” my mother in law passed along which weren’t very English-muffiny… but were good vehicles for the stew. Now – go cook something delicious. *Lest you thought I forgot… parsnips are pretty wonderful. The Folks over at Putney Farm have posted some great recipes for them – I suggest you check out their page! 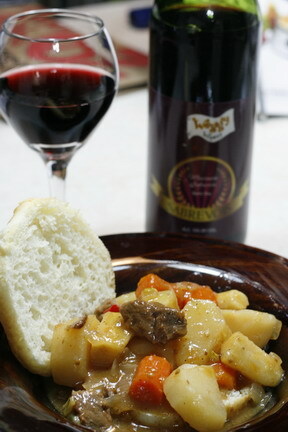 Weggy Winery Sabrevois, Kitchen Sink Beef Stew and wine. This entry was posted in Chickens, Cooking, Musings, Random Thoughts and tagged crock pot cooking, crock pottery cooking, Kitchen Sink Beef Stew, Putney Farm, Putney Farm blog, Reynolds crock pot liners, Weggy Winery, Weggy Winery Sabrevois. Bookmark the permalink. That’s the way to it! Looks amazing. Thanks for sharing this one! YOU are welcome! I’ve been only cooking about once a week from sheer laziness… leftovers are an awesome thing! Awww. Now, give him some credit 😉 When in doubt, Kitchen Bouquet and Beef Bouillon will be his friends.